Today’s mass produced homes rarely use architecturally pleasing window and door trim. Most homes today are built with a very basic colonial trim with mitered joints. Obviously this is done in an effort to reduce building costs while providing a basic look. Older homes traditionally featured very ornate and detailed window and door trim. This was especially true for homes from the colonial and federalist period. Walk into one of these older homes and you’re immediately impressed with the craftsmanship that was needed to trim one of those homes. We’re building a custom home for come clients right now and they had some very specific requests for window and door trim. The home owners wanted us to create a more detailed trim package that included fluted casing around the windows and doors. They also wanted to use a “picture frame” approach to the windows without the more traditional stool and apron look. They also wanted to incorporate “rosettes” into the design to eliminate miter joints that might “open” up. Having this information we ended up mocking up several different combination’s of baseboard, casing, rosettes and plinth blocks. 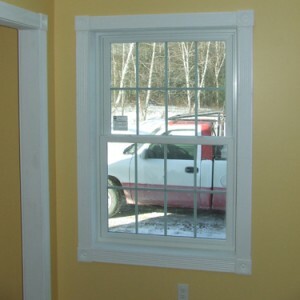 Mocking up sample window and door trim is an excellent way to get all the proportions right and also to make sure things will look the way you want them to before purchasing lots of trim materials. The homeowners selected the rosettes that you see in the photos for all the corners of the windows and doors. Rosettes are an excellent product to transition the corner of casing to help eliminate shrinkage gaps that are often found in mitered joints. As you can see the rosettes add a very elegant look and texture to the door and window trim. The rosettes that we used were 5/4 (full 1″ thick) and 3-1/2″ by 3-1/2″. Fluted casing can really dress up an otherwise boring window or door. On this project we ended up using a 3″ wide fluted trim. Having the trim slightly narrower than the rosettes and plinth blocks adds a nice reveal. The fluted trim is only 4/4 (3/4″ actual thickness) so that allows a nice reveal out of plane again compared to the rosettes and plinth blocks. The plinth blocks are attached at the base of the door casing to form a “column base”. Plinth blocks add a very nice detail but they take some tinkering with to get the proper proportions. In fact, on this job we changed the plinth block dimensions during the mock up phase several times. We ended up using a piece of 5/4 material that’s 3-1/2″ wide (same width as the rosettes). The key was settling on a height that was the proper proportion to the door height and baseboard. I think you’ll agree the proportions look very nice with this detail. 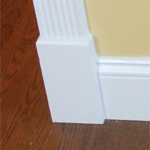 The baseboard for this project ended up being 4″ tall 3/4″ base with a cap molding for a total height of 5-1/4″. The home owner hasn’t decided yet whether or not to use a shoe mold at the intersection of the hardwood flooring. 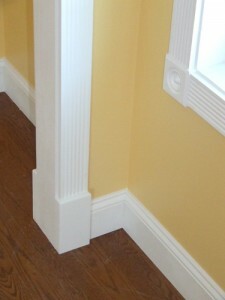 The baseboard detail used here is a fairly standard colonial style baseboard. This is what we’d like for The Stone House project. Though not Colonial, the house is from 1888 and we did find one set of rosettes on one of the door frames and would like to carry it throughout the house. I love the look! I love seeing new homes actually using decent trim. I hate nothing worse than to walk into a big new home and seeing extremely thin, cheap trim everywhere. Right final trim is essential to protect the edges of the door or window furniture. Additionally it add beauty and gives an extra ordinary look. Good pictures and advice. Trimwork makes a house look great. 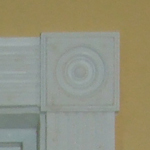 i am looking for fluted trim window casing 5 inches wide in rot resistant wood i am in orlando florida very wet climate cannot seem to find this width anywhere can you help?? Mike – You’ll likely have to custom make it or have a mill shop do it. That way you get the width you want and the type of wood you need.